Well, moaning Gigi and Pippa is more like it. 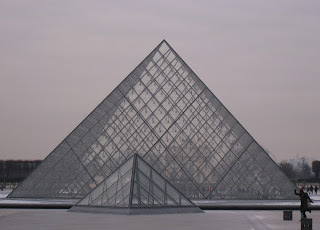 The Louvre is not, shall we say, very kid-friendly. At least not friendly to our kids. Notice the half-hearted smiles. You might even say they're Mona Lisa smiles. We do not have long lines, and we get there early to avoid big crowds. We head directly to the Mona Lisa -- called "La Joconde" in French -- and are able to walk right to the front. Nevertheless, the girls are underwhelmed. Sacrilege Alert: Gigi asks, "Why is it so famous? That is -- literally -- the most boring painting in the entire museum." And I must agree. On the other hand, if you are standing at the Mona Lisa and turn around, you will see a crowd of people facing you, craning their necks to see La Joconde, and behind them -- completely ignored -- "The Wedding at Cana" occupying nearly an entire wall. 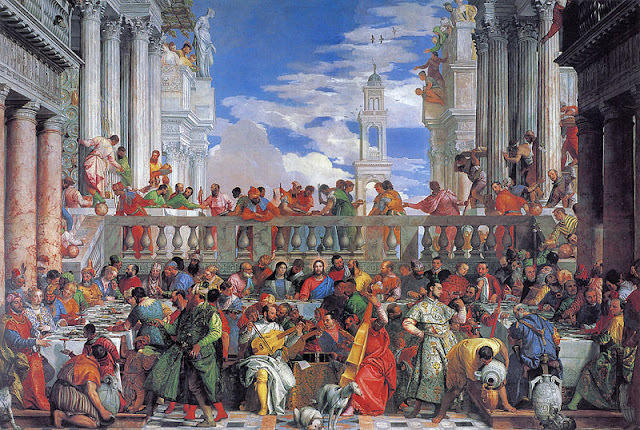 This painting, complete by Italian artist Paolo Veronese in 1562, is 6.6m x 9.9m -- that's 21.6' x 32.5'. It's fascinating, huge, detailed, colorful, and seems like it would have been completely impossible to paint. It gets my vote for best painting in the Louvre (well, best of the ones I see, since Lord knows I don't actually see them all). Why is this not more famous than the Mona Lisa? We all agree that Veronese got robbed. 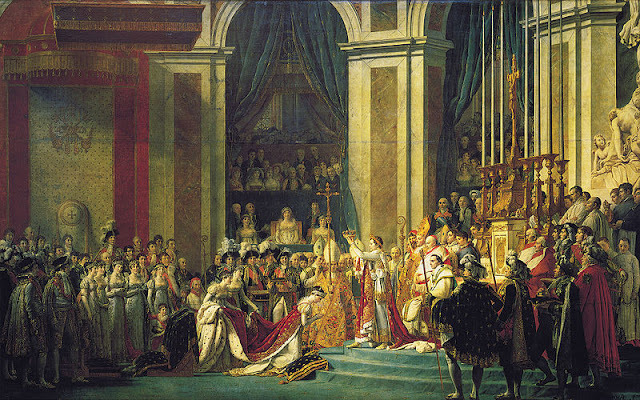 Another amazing painting on the same scale is "The Coronation of Napoleon" by Jacques-Louis David. Granted it is "only" from 1807, but it also stands about 6m x 10m. 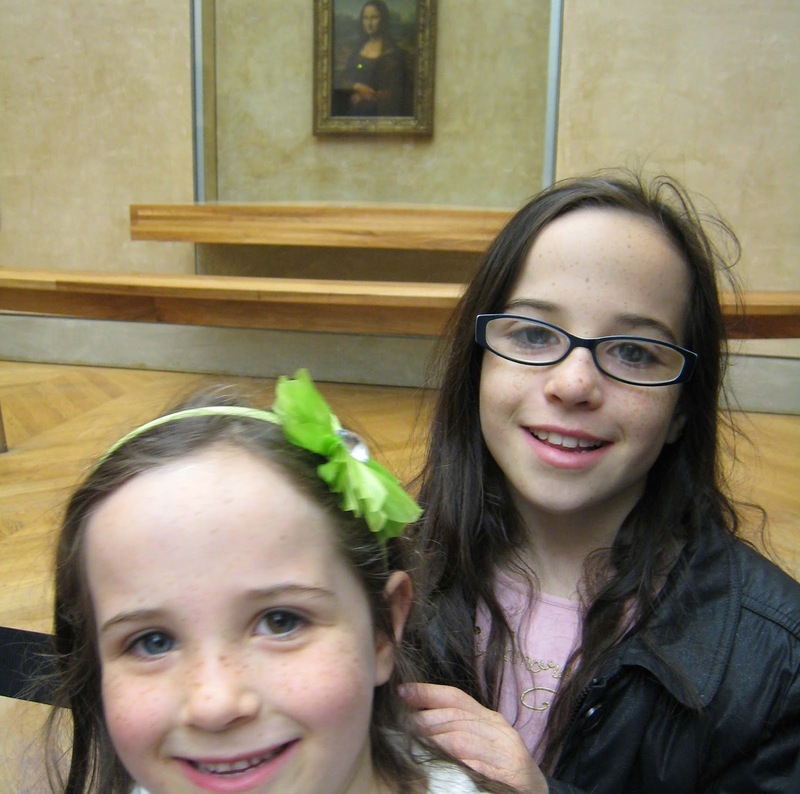 It both dwarfs and fascinates the girls, and Gigi would much rather look at either of these impressive paintings than the ho-hum Mona Lisa. ... the vending machines in the subway. Yes, having just visited and poo-poohed arguably the most famous painting at the most famous museum in the world, the thing they enjoy most is that we allow them to buy a drink from the vending machine. Since we have lost approximately 50% of our money in all attempted vending machine purchases, the fact that we are willing to let the girls try at all is a huge and very exciting victory for them. The fact that the drink actually comes out this time is almost more joy than they can bear. Well, good. At least they're not moaning anymore. 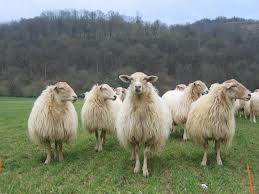 Napoléon is an artisanal cheese from the Pyrénées made from thermised whole milk from Manech breed sheep. Okay, I'm not sure thermised/thermized is a word in English. But it is in French: thermisé, and it means not pasteurized but heated to 57-68°C for at least 15 seconds in order to kill bacteria. Also, I'm not really sure what a Manech sheep breed is, but I'm pretty sure I couldn't tell it from any other sheep breed. I do know it's the same breed used to make the very famous (and very delicious) Ossau Iraty that comes from the same region. The taste is pleasantly salty and fruity at the same time (well, fruity for a cheese). It's aged 10 months and comes out smooth and firm. Technically, it's a hard cheese, but "hard" is really not quite the right word, which implies something more brittle and crumbly. This is very firm, but almost velvety to the touch. What is undoubtedly hard is finding Napoléon -- yet another cheese that doesn't appear much online, in books, or even in stores. There's no cheese I can find named after La Jaconde, aka the Mona Lisa, or even Da Vinci. But that's OK by me, because as far as I'm concerned, the painting of Napoleon should be more famous anyway.